Some stories are so good you have to find a great ending for them. Right? Even if that great ending is going to require a couple of sleepless nights, planes, trains, automobiles and a complete lack of any trace of good sense. Sometimes the story demands it. Strike that. It’s the person. It’s the person who demands it. 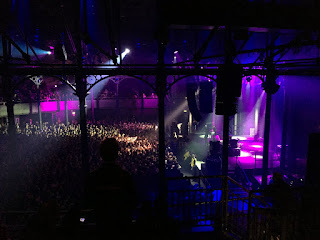 Some of you will perhaps recall my story from a few weeks back about how my younger son and I went to see his favourite band Death Grips in Dublin, about how we couldn’t get in but how, through a series of good-natured occurrences and a bit of perseverance, we managed to turn it around. You can read the story here, if you missed it. It’s not bad, even though I say so myself. It was a story with a happy ending. No doubt about that. But it was also kind of a sad ending. The point of the day had not been to meet people and to have an adventure, although that was wonderful. The point of the day had been the Music. And we hadn’t got to hear the Music. So when a London Roundhouse gig was announced, I sat and stared at my computer screen for a long while. It was too far to go, too expensive by a long shot, too crazy really. Things only really became clear when social media announced that the gig was sold out. The sharp stab of regret I felt then. That said everything. That stab told me that this was important enough to throw out a few more of the rules. To give it one more go. It turned out that the gig wasn’t sold out. The main floor was sold out but there were seats around Level Two available. I nabbed two directly from The Roundhouse. Level Two was fine for us. One member of our two-person party was still a notch too young for the excesses of the main floor and the other member was far, far too old. At first, Sam wasn’t entirely up for it. I made the proposition too late at night and it certainly not something that he would ever have conceived of suggesting himself. He’s a cool guy and wouldn’t like to hear of people going to silly ends for him. It’s just, like I said, sometimes a good story requires a great end. It’s a Bank Holiday Weekend here (yay) and that’s great (hence the ‘yay) but it also meant that getting to London became a seriously expensive business for this one weekend. The ‘Straight Route’ was not economically viable so we kind-of had to go the long way around. The 'scenic route'. On Saturday morning, Sam and me got up at 3.00 am and, without too much preamble, got on the road to Belfast in the car. That took a little under four hours, the roads being surprisingly quiet. From there, we flew to Luton Airport and from there we 'public-transported' ourselves into London. Last night, we did what we had to do then we public transported back to Luton to be at the airport for 5.30 am to grab the earliest flight back to Belfast and then drive home. You’ll forgive any typos, I hope, I’m a bit tired. A thirty four hour round trip. Just to see Death Grips. Sam couldn’t get in to the Dublin show because he wasn’t over eighteen. This, then, was his gig. You could get in to this one if you were sixteen and he is. We milked it for every experience we could. We arrived early and sat outside with those keenest fans who wanted to get right up close to the stage. We chatted and drank water and watched the touts do their thing. Several of the people we spoke to knew about Sam and his Dublin Escapade from his account on the Death Grips fan forums. That was fun. We had great seats in the Roundhouse. Outside the columns, obviously, but finding one of those angles through where everything could be clearly seen. We took our seats just as the first people were making their way in below. Far too early to be cool but this is why we were here and we both wanted to get it all. There was no opening act. The huge speakers played an eternally-rising tone interspersed with random voices and noises. A ‘Shepherd Tone’. If you don’t know what that is, look it up. It’s interesting and uneasy all at the same time. Then the band came on and we saw them play and then we went home. I never expected, in all this melee, to become a fan but that is what’s happened. I am perhaps the oldest ‘Death Grips’ fan in the world. I would never want to be on the floor in front of them when they play. I think that would probably kill me. But I’d dearly love to see them do again what they did last night. I’d love to see crowd and band unite once more in that awe-inspiring jaw dropping thump-thumping synthesis of excess. It was easily one of the most extraordinary shows I have ever seen. In an unheard-of beginning, the normally half-naked trio trooped on to the stage in matching blue suits, white shirts and ties. They launched into a show which lasted for 90 minutes and which never stopped, not for a single moment. The crowd did not applaud, they were given neither time nor opportunity. Song after song rolled into each other. Head grabbing, trippy exclamations laced with frenetic back beats. In my ignorance, I had expected Ride, the lead man, to be somehow sullen and aggressive. He was neither. Brash and vehement, he stomped and tromped around the centre stage, pushing his vocal chords to the edge of pain and perhaps beyond. Zach, the drummer, was a complete virtuoso and my eyes couldn’t stay away from him. His work rate was beyond credibility and his blue suit must have been utterly destroyed by the end. Behind his band of computer and keyboard equipment, Andy jerked and bopped and stared, his subtle machinations the backbone of the ensemble. The crowd, before so placid and patient, turned immediately, upon hearing the band’s first chord, into a seething mass of energy and motion. A vast swelling sea of people melding and colliding, being lifted up and torn down. It was a collaboration between band and audience and when it was finally over, everybody knew it. Instruments were thrown and kicked down, a quick departure was enacted, with no meaningful plea for any encore. Neither side had any more they could possibly give. I had expected to find a band with a punk mentality. A sort of aggression thrown at the crowd and it being reciprocated in spades. Instead I reckon I saw a band revel in their skill and musicality, in their ability to rock the house and an audience who demanded nothing more from them than to be allowed to rock right along. It was something totally different, something completely alive. It was one of the best things I’ve ever seen. Right at the end of the evening, as the crowd was pouring out, three people, two men and a woman, came down from some seats further back. They sounded Canadian, I could be wrong. One of them, a bearded guy, offered me his hand. “I just wanted to come down and say that I think you’re a really cool Dad,” he said. He sounded as if he already knew our story. Sam and me and the events that had taken us to this place. As it turned out, he didn’t. So I’m still not sure what he saw that made him come all the way down and tell me that. Maybe he just saw me occasionally finding a slightly better view for Sam. Maybe he just saw me giving him a little space to enjoy the show in his own way and not crowding him out too much. Maybe he just saw me enjoying it all in my own 53 year old way. Maybe he just saw me at the end telling the introverted solitary guy next to us how hard he had rocked for the band and the surprised smile I had gotten in return. I don’t quite know what he saw. For a moment, I thought I almost saw it myself. Anyway I’m glad we did this silly thing. But I think I'll go to sleep now. Sleep well Ken and I hope this sequel does as well as the first. Thats a fantastic storey Ken, Sam is one lucky lad! As a 42 year old who just had to cancel his tickets for a (not Death Grips) gig later this month, I am jealous beyond words of Sam and your adventures. Nice sequel to the Dublin gig post. Cool Dad!